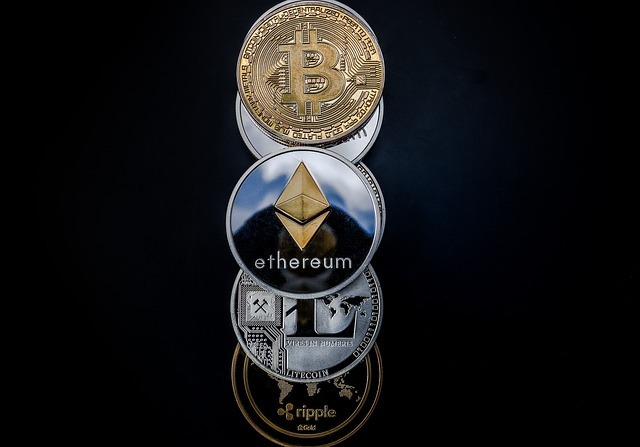 The recent stratospheric rise in the value of certain cryptocurrencies, has brought about global awareness of the existence of Bitcoin and ethereum. These two are the most valuable cryptocurrencies. By February 2018 the total value of Ethereum in use was marked at $88 billion while that of bitcoin was higher at $143 billion. This can be translated to Bitcoin being held at the same value as Unilever, while Ethereum is held at the same value as Starbucks and Walgreens Boots Alliance. Today the investors in the cryptocurrencies listed above are highly speculative. This forces the cryptocurrencies to be highly volatile with the prices and value proving hard to accurately estimate. 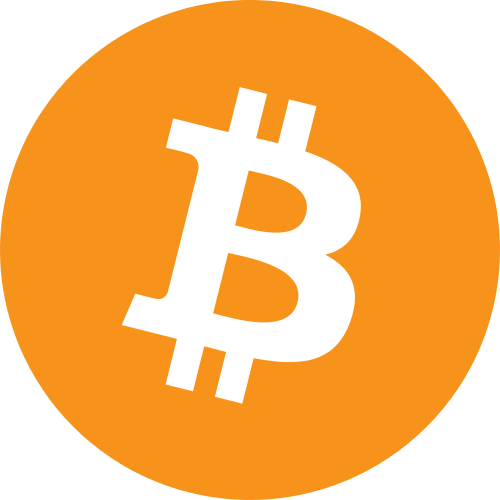 Bitcoin is the first decentralised cryptocurrency and is a globally accepted payment system. The currency operates without a bank or administrators. The transactions are based on peer-to-peer and they take place without the intervention of an intermediary. The transactions are then verified by the network nodes through a cryptography and recorded in a ledger referred to as a blockchain. The bitcoin cryptocurrency was created by an individual or group of individuals using the name Satoshi Nakamoto. It was released into the market in the year 2009. Mining is the process of acquiring bitcoins from the open source software. Once acquired they can be traded for services, goods and other currencies. Today more than 100,000 merchants accept payment in bitcoins. By 2017 there were more than 5 million unique bitcoin users of bitcoins. Ethereum is a computing platform that is decentralised, blockchain based and has an operating system that features smart contract functionality. This platform was invented in the year 2013, by a cryptocurrency programmer and researcher, Vitalik Buterin. The development of the platform was then funded by crowdsale between the months of July and August in the year 2014. In 2015 the system went live. There were 11.9 million coins that were pre-mined at that time. This is only 13% of the total amount of coins circulating online today. Ethereum Virtual Machine executes scripts with the public nodes formed through the international network. It also uses a pricing mechanism called gas that enables spam mitigation and allocates resources rightfully on the network. Bitcoin was created by one individual or a group of people under the name Satoshi Nakamoto. Ethereum platform was invented by Vitalik Buterin. Bitcoin network creates a total of 12.5 unique bitcoins every ten minutes. Ethereum creates three unique coins every fifteen seconds. Bitcoins are limited to a total of 21 million coins. As of today there are 16.7 million mined. Ethereum doesn’t have a currency cap, so far, there are 96.4 million ethers circulating. There are however, plans to cap the issuance after a couple of years. Bitcoin network creates new blocks on average every ten minutes. Ethereum creates new blocks within every fifteen seconds on average. Ethereum uses a Turing-complete full multi-purpose integrated language. Any contract that is built with this language is referred to as a smart contract. Bitcoin has a built in scripting language that is limited and can only complete a couple of operations. Bitcoin transactions are always based on the size or amount. Ethereum transactions are assigned a cost referred to as gas, this occurs with all operations or the use of the storage provided on the blockchain. The blocks of bitcoins are limited to 1MB or 8BM for the Bitcoin Cash. For Ethereum, the blocks are limited by gas-limits. Which is the total overhead for all operations within the block. In conclusion, bitcoin can process four transactions within a second while Ethereum can process fifteen. Ethereum has two accounts, one holds the funds of the user, the other stores the computer codes. Bitcoin has only one account that stores the funds and the related codes. The bitcoin algorithm (SHA-256) is performed efficiently with the use of special hardware referred to as ASICs. ASICs are application specific integrated circuit. The Ethereum’s algorithm (KECCAK-256) is more complicated and memory intensive, such that no special-purpose chip can be used to perform the algorithms. Ethereum plans to move from the mining process by changing the algorithm from Proof-of-Work to Proof-of-Stake. The PoS invents blocks on the basis of the token holdings of the network nodes rather than the previously used computational power. Ethereum also plans on tackling scalability by using a sharding process. Sharding breaks up the blockchains into several interconnected sub-blockchains. Bitcoins has not made any related future plans. Bitcoin is a globally accepted payment means and a decentralised cryptocurrency. Bitcoin was released in the market in 2009. Bitcoins are limited to a total of 21 million coins whereas ethereum platform has no limit. The bitcoin technology can only issue 12.5 bitcoins every 10 minutes, ethereum can issue 3 ethers every fifteen seconds. Bitcoin blocks are created every ten minutes while one ethereum block is created every fifteen seconds. Currently the ethers circulating in the market amounts to $88 billion while the bitcoins circulating amount to $143 billion. Evah Kungu. "Difference Between Bitcoin and Ethereum." DifferenceBetween.net. 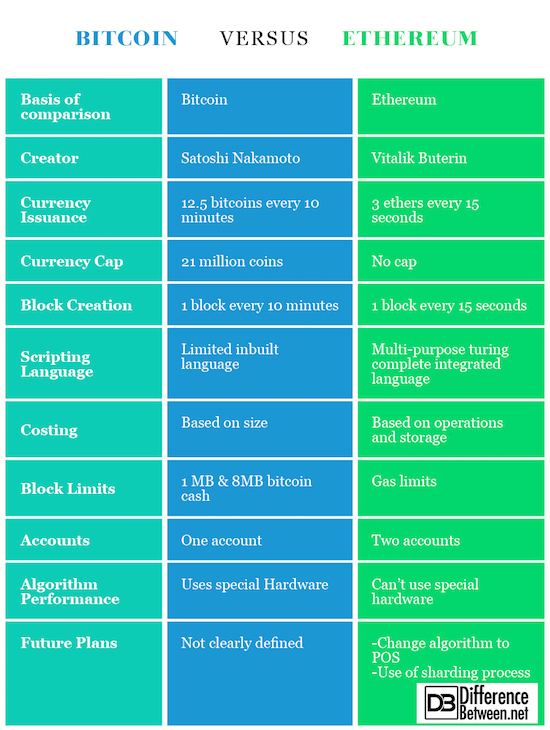 January 28, 2019 < http://www.differencebetween.net/business/finance-business-2/difference-between-bitcoin-and-ethereum/ >. Harper, Chad B. Bitcoin Vs Ethereum: Cryptocurrency Investing Tips You Wish You Knew. CreateSpace Independent Publishing Platform, 2017. Scott, Michael. Ethereum Mining: The Best Solutions To Mine Ether And Make Money With Crypto. 2018. Cohen, Matt. Cryptocurrency: 3 Manuscripts - Bitcoin, Ethereum, Blockchain. CreateSpace Independent Publishing Platform, 2017.